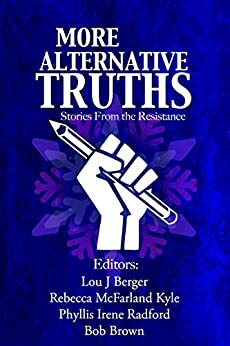 My story, A Spider Queen in Every Home, appears near the end of this book, More Alternative Truths: Stories from the Resistance. The story takes place in Davenport, Iowa, where I live. Set in the near future, it explores the reluctance of some people to deal with cast-iron facts, and the consequences of such pigheaded, willful wrongheadedness. There are giant insects, too, because they’re always fun! The story also dwells on how science and political ideology make poor bedfellows. The plot was inspired in part by Trump administration officials instructing their departments to stop talking about inconvenient truths, such as climate change, because they don’t fit in with Trump’s personal beliefs and/or his political stances. More Alternative Truths is an exploration of the potential consequences of today’s politics in our daily lives. More than our individual lives, but our American identity. This exploration defines this anthology. So many of the stories ask what has America become? What will it be in the future? Will it devolve into a Russian style oligarchy, or will we rise to the challenge and use our hearts, our minds and our votes to return to a rational democracy, of, by, and for the people. No one knows for sure. But these top-tier talented authors from around the world, from Philip Brian Hall to Bruno Lombardi to Jane Yolen give us their visions. Of interest you might find Lou Antonelli’s “Queens Crossing” a unique view of alternatives. What if the Donald had moved to Cleveland. Just remember, Cleveland Rocks and so does this story. You will find the witticisms of Jim Wright exploring Donald Trump as Moses after presentation of the Ten Commandments. The mental genius of Edd Vick and Manny Frishberg as they give us Trump, tweeting his way across the solar system. There is much to laugh about. There are serious visions as well. Brad Cozzens’s brilliant poem “America Once Beautiful” reaches poignantly from today’s reality into some salvageable vision of tomorrow that borrows from yesterday’s values. The poets in this volume, be they Brad, Jane Yolen, Gwyndyn T. Alexander or C.A. Chesse, bring new meanings to words and leave you thoughtful. If you want a fun romp, jump to “Wishcraft.com,” by Elizabeth Ann Scarborough, as she explores how important it is that political hacks not annoy witches. Or, if you prefer, K.G. Anderson’s, “The Right Man for the Job,” in which a post-corporeal LBJ rides to the rescue. There are so many more great stories in this collection, I can truly recommend them all. If, however, you can only read one, then read Eric M. Witchey’s “Small Courages,” and let it touch you, maybe bring tears of hope, as you see our world through the eyes of a child and find that we can survive. We will survive. Read on for the full list of who contributed to this amazing collection. There are some very famous names on this list! The reviews so far on Amazon are uniformly positive, 5-star recommendations for the book. I am thrilled to be in such stellar company! Please don’t forget to leave your own review.